Over the last 10 years, I have coached riders of all ages and abilities and one thing has become abundantly clear – everybody is different. Bryan’s unique style of coaching uses all the knowledge of his over 20 years competing at Olympic and World level bringing together the latest coaching techniques to support you to achieve your cycling goals. Bryan feels that everyone is different, so all of his coaching programs are bespoke to individual riders needs, developing the rider through his 8-phase plan, while maintaining a health lifestyle and work/family/life balance. Let me share my pioneering approach with you through a range of coaching options, from remote mentoring to bespoke one-off sessions. Whatever the rider’s goal, my 8 phase coaching structure creates joint accountability between the rider and myself by outlining a clear framework and timeline to ensure they are ready to ride to at their optimum. Drawing upon my experience each phase typically lasts approximately 3 weeks but if the rider or I decide that more or less time is required adjustments will be made. After this period, we will have a coaching review to assess their progress. This review allows me to make any tweaks to the riders training to ensure that we address any continued areas of weakness, as well as, allotting enough time to develop their strengths further. My 8 phase coaching structure addresses this through developing the rider’s cycling technique and tactical awareness so that the hours they spend are efficient and faster. By emphasising the development of the rider into a complete cyclist it is easier to track their progress and achieve their goals. Bryan will share his knowledge and skills of riding at the world’s highest level for 20 years so that you become a more effective, efficient, safe and confident rider. Each masterclass is tailored to the needs of the group including ability, length, route and speed. Ride with Bryan so he is able to look at your riding position. Let Bryan make changes to your riding position making sure you are riding effectually while being comfortable. Have you’re riding style and position videoed to maximise your performance. Understand that by riding in a relaxed way, you are able to save energy and to put more energy onto the pedals. Learn by riding from the pelvis down so that you are able to apply more power to the pedals. Learn by leading with your heels that you are able to apply power through 360º of the pedal stroke. Understand by using the right gearing that you will be able to climb more effectively. Learn how by pacing yourself on hills you are able to recover quickly and get back to your race speed. Learn how to descend faster and safer by using your weight and balance. Learn how to find the clear air behind a rider so you are able to slipstream them. Learn how to sit on a rider’s wheel so you are able to have maximised recovery. Work with other riders so you are able to bridge to other groups. Are you looking for a new challenge for 2019 or would like the opportunity to take your cycling to the next level? 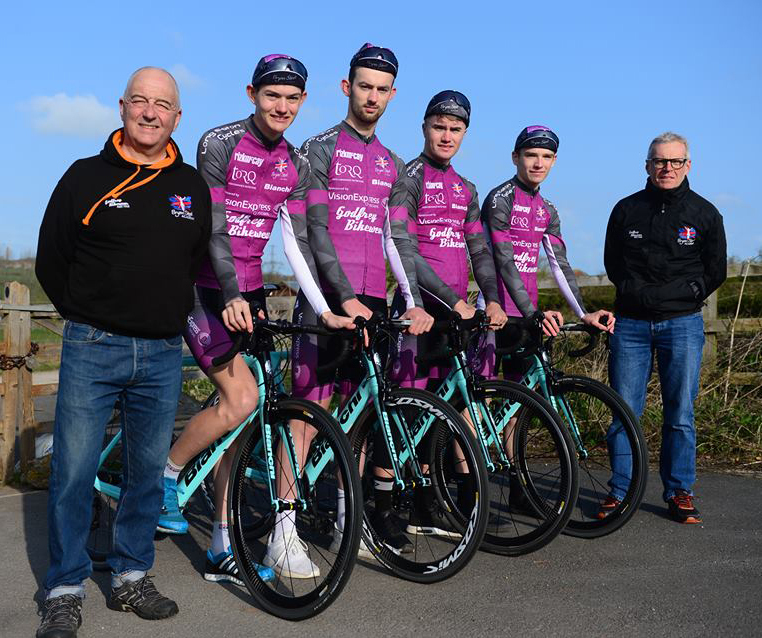 Working in partnership with All Things Ride, come and be part of my revolutionary Bryan Steel Grand Fondo team, which gives enthusiastic amateur cyclists a peek into the world of professional road racing. I am committed to providing my members with the best possible environment to achieve their goals. Therefore, my team and I want our members to experience the latest training techniques, tailored nutritional programs, physiotherapy, race schedules and much more. In exchange for the plethora of services we offer, we expect our members to throw themselves into our training and most importantly, have fun! The Bryan Steel Grand Fondo Race Team gives ambitious amateur cyclists the opportunity to experience a professional racing team setup by providing a bespoke service developed by double Olympic medalist Bryan Steel and his support team. As part of the service you will receive a personalized training program, racing schedule and other support aimed at optimising your preparations for some of top UK Grand Fondo's as well as the opportunity to experience some international Grand Fondo's with full support. Come and be part of my revolutionary Bryan Steel Track team (BST), which supports track riders to achieve their best at National, European and World master events. In exchange for the plethora of services we offer, we expect our members to throw themselves into our training and most importantly, have fun! The Bryan Steel track team uses all my experience of riding at the World and Olympic level for over 15 years giving you the opportunity to compete and win medals at the highest level. As part of the service, you will receive a personalised training programme, track sessions, event support and other support aimed at optimising your preparation in your target event. Regularly organised group training sessions with other members of the team. Visit our Sponsors page Sponsors and Partners for more information.